Cornbread Veggie Sandwich. 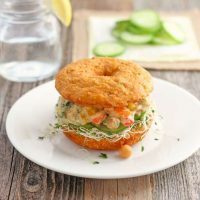 Treat yourself to a tasty lunch of creamy hummus, chickpeas and lots of crisp fresh veggies sandwiched in a savory Cheddar Sriracha Cornbread Donut. This is an updated post from our recipe archives. Haha, it feels silly saying “archives” like Toaster Oven Love has 1,000 recipes. Nowhere near 1,000 but in a few weeks, we will be at our 100th recipe! Last week we gave the site a small makeover. There’s lots left to fix but we hope you are enjoying the changes and find it easier to navigate the website. After the update, I was looking through the recipes and saw the original post for this sandwich. It had 3 sentences that basically said this tastes good – you should eat it – yum! And the photos, oh-my-gosh I was so close to the sandwich it was just two craft store googly eyes from turning into a chickpea monster. Seeing that old post got me thinking about how much fun the last 16 months have been. Toaster Oven Love is hard work (I’m looking at you social media) but in return, I have gained a new set of skills and been blessed with meeting many seriously cool and very generous people. Family and friends message me photos of their toaster ovens. Strangers are making our recipes and actually enjoying them, though not everyone has and that’s okay. Last week I had to call my domain provider and the customer service agent asked “What’s this website about? I’m going to check it out tonight because all I use is my toaster oven.” That brightened a rather difficult day! I guess I just want to say thanks so much for supporting this toaster oven fanatic and making her feel like she’s not totally lame for getting excited about sweet potatoes and avocado toast. Alright, I’m going to stop now because as the kids say “I’m feeling all the feels” and really you need something to eat…like a cornbread veggie sandwich. So for this tasty sandwich let’s start by mixing together a big scoop of your favorite hummus and a handful of cooked chickpeas. Toss in chopped bell pepper and a pinch of fresh parsley. Take a quick taste and add salt and pepper if you want. Next, grab a toothy Cheddar Sriracha Cornbread Donut (what you don’t keep a stash in your freezer too?) and slice it in half, pile on alfalfa sprouts and a few cucumber slices. Scoop that chickpea mixture onto the veggies and slap the other cornbread piece on top. 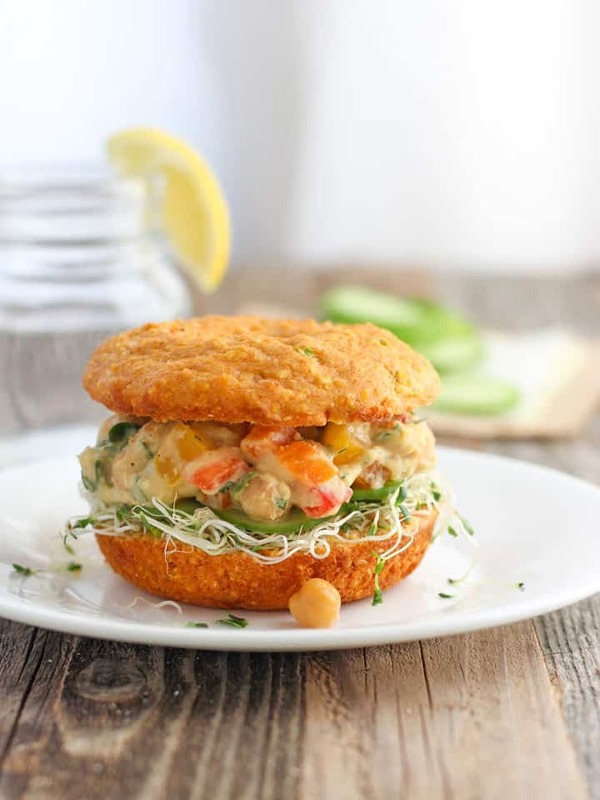 Now prepare to dig into your crispy, creamy, crunchy super flavorful Cornbread Veggie Sandwich. Things might get a little messy but it’s going to be ohhhh sooooo worth it! Like I was saying before there are a ton of creative, kind and generous people online. 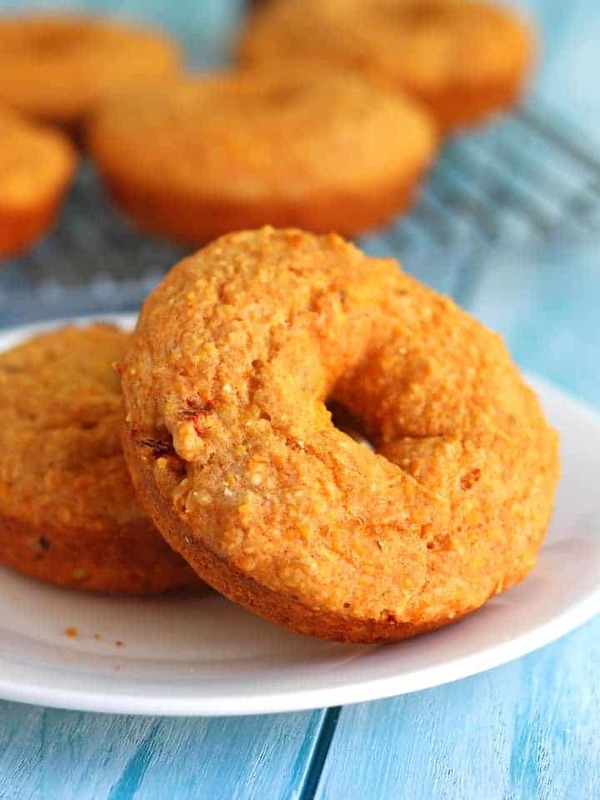 One of them is Sam at the Quantum Vegan, she created a Veganized Gluten-Free Donut inspired by our Cheddar Sriracha Cornbread Donuts recipe, you should really check it out! 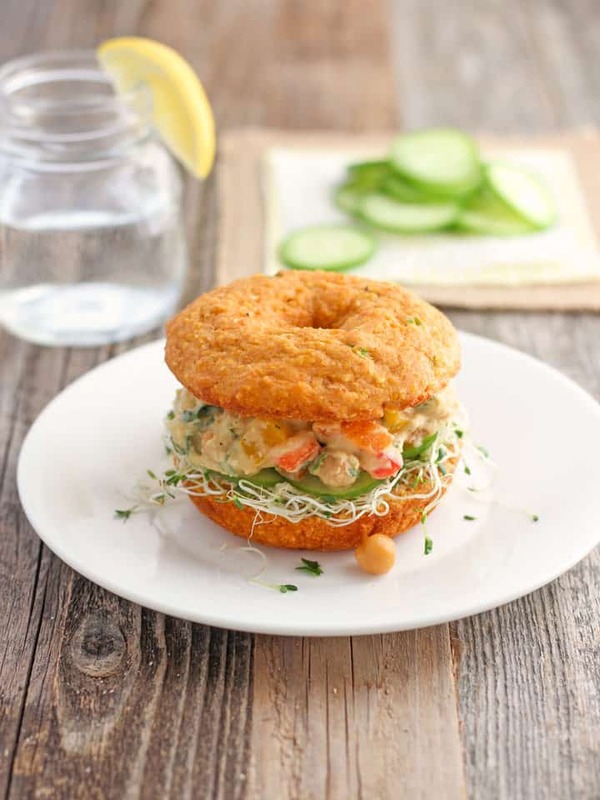 Crisp veggies and creamy hummus on a hearty sriracha cornbread donut. In a small bowl stir together the hummus, chickpeas, bell pepper and parsley. Salt and pepper to taste. Carefully slice the Cheddar Sriracha Cornbread Donut in half lengthwise. On the bottom half of the donut layer the alfalfa sprouts and cucumber slices. Scoop hummus mixture onto sandwich, place other half of donut on top and enjoy. Total Time does not include preparation of Cheddar Sriracha Cornbread Donuts. Thanks so much Kathryn you really are the sweetest, Happy Mother’s Day!!! Yay, thanks Sam! I just picked up some oat flour so I could give your recipe a go. I’ve been having a string of epic vegan baking fails – I know your donuts will be a sure thing 🙂 and delicious!